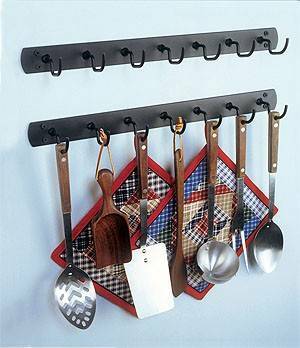 This simple strap iron rack with 7 hooks is perfect for hanging mugs, pots, pans, kitchen utensils or dishtowels. A great way to keep your necessary kitchen tools handy, while keeping them organized and out of the way! Measuring in at 19" long, you'll have enough space have those utensils at your fingertips! Plus, you'll be able to enjoy those kitchen tools on display even when you're not cooking!